In the game's story, a bunch of angels ("the Fallen") have descended upon mankind, subjecting humanity to repression in an attempt to instigate Armageddon. God, feeling compelled to initiate one himself before the angels do, sends one of His most trusted soldiers (that's you) to stop the Fallen so that He doesn't have to kill all of mankind before the fallen angels do. Makes sense, of course, if you're familiar with the biblical view of God as an omnipotent, mass-murdering, self-important jerk. Some may feel put-off by the religious theme, but I, despite being an iconoclastic atheist, found it refreshing in a few-would-dare-go-for-it type of way. 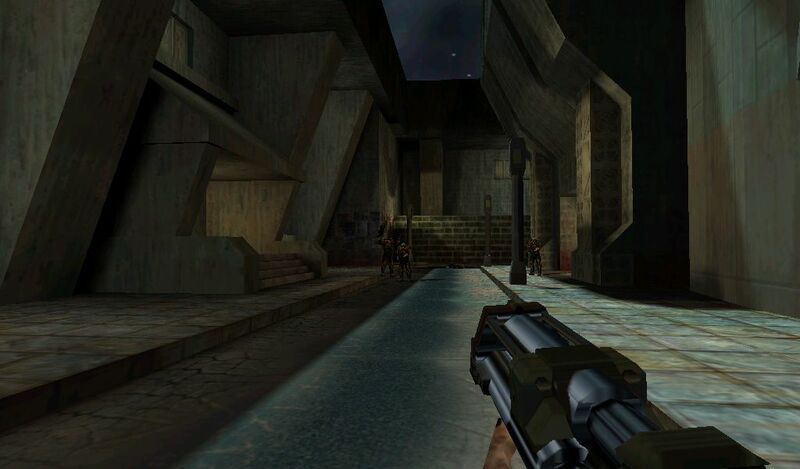 Requiem: Avenging Angel is an obscure first-person shooter from the early 1999. I've been constantly aware of its existence since then and always wanted to give it a try, so here we are, almost exactly 20 years later. The game isn't as much an oldskool shooter as it's a product of its particular time, that being the post-Rainbow Six era with its sharpshooting hitscan enemies that can eat away most of your health in a split second. But this game is still a game of speed, not tactical realism. You'll eventually get used to the pace and spamming the quicksave key after every successful encounter because of the perennial "blink and you're dead" factor. (A quick peek at gameplay videos on Youtube indicates the game is a lot more forgiving on the easiest difficulty setting: I played the game on normal/Purgatory.) The game's respawn generators can also be really obnoxious; turn around and you'll have five bad guys spawn right behind you. In many ways this is not an era that'll be missed. 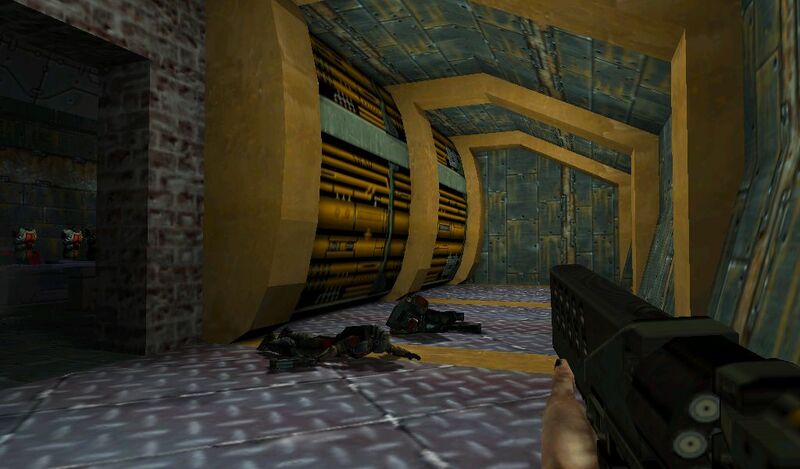 But once you finally come to terms with the game's pace and sharpshooting enemies, there's plenty of fun to be had. Weapons feel powerful, especially after the god-awful Sin with its peashooters. In fact, entering a room and mowing down a bunch of enemies with an assault rifle hasn't really felt this satisfying since Wolf3D. Amidst all the carnage, only the pistol quickly becomes useless. The grenade launcher has a pitiful range but retains its usefulness for lack of better alternatives until you get your hands on the rocket launcher. The railgun kills and destroys everything but bosses with a single shot. 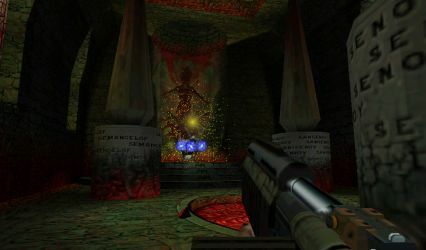 Only the bosses are a lame diversion from the otherwise fun combat, being either nothing but your usual circle-strafe-and-shoot affairs (including the final boss) or just extremely frustrating save-load fests (Lilith). The "angelic" powers are, in sharp contrast to the man-made weaponry, pretty much a useless gimmick, and that you're basically forced to use them against some of the bosses doesn't really improve their appeal. The novelty of watching someone turn into salt or have their blood boil quickly wears off as you realize the powers aren't effective enough to compete with traditional firepower. The only power I found useful was Heal; even though it heals you for a paultry 5hp (making it basically useless when you really need it), it costs next to nothing to spam it at every opportunity, even mid-combat. Some powers are needed to solve puzzles (such as using haste to get to a timed door), but such instances are rare, as if a mere afterthought. 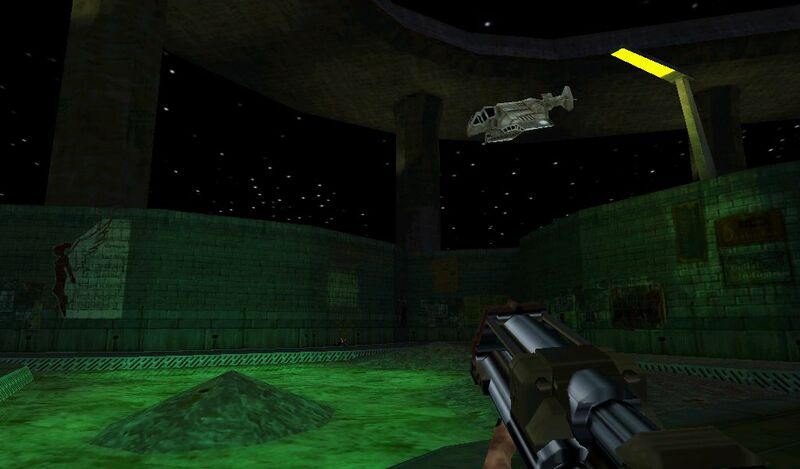 Map design in Requiem is good throughout. 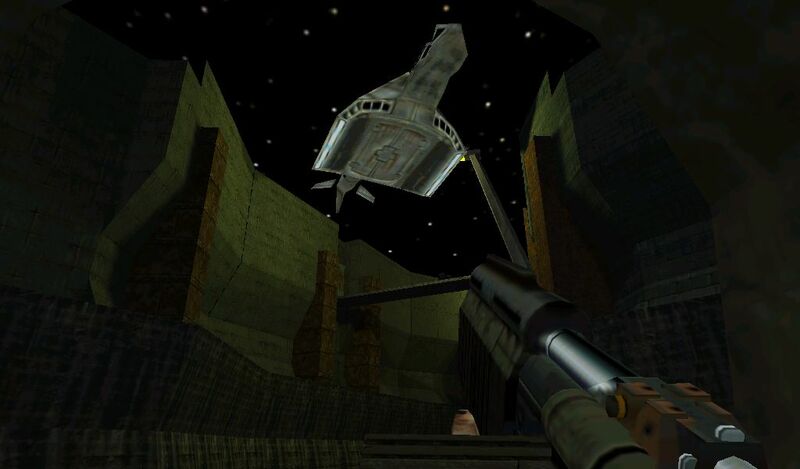 The game runs on its own engine, but visually the game is not that different from the Q2 engine games of its era. 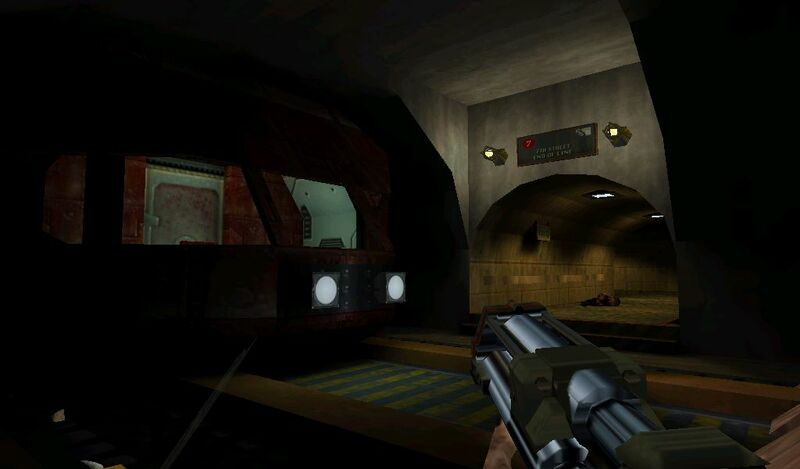 The maps (which are small and combine into larger units as in Half-Life) are roomy with large, arched hallways and plenty of big machinery and sloped surfaces, just the kind of stuff I've grown to love in recent years. Perhaps the maps aren't as detailed as those in Sin, but at least the player has plenty of room to move around and large-scale architecture to enjoy. The game's Christian theme has been put to good use: the world of Requiem feels oppressive and violent, even gory at times. There is a definite emphasis on various facilities and tech bases, but the game also features city streets and other urban themes. As was increasingly common at the time, you also get to interact with various NPCs, although in a limited fashion (a smart move considering the challenges of that era; see Daikatana). Unfortunately the game has not been properly updated to run on modern hardware and operating systems. There are graphical glitches, hideous low-resolution menus, the sounds are distorted, the music is very loud and cannot be adjusted (without turning it off entirely) and the screen starts to flicker between full screen and windowed every time you want to check the menu. I also heard of game-breaking bugs, but fortunately I ran into only one of these and that was very early in the game. You also need to use a Glide wrapper to select higher resolutions. Just make sure to go through the various exes (including nglide_config) in the game's folder. In any case, you'll probably end up spending an hour or so of the game's five-hour length on getting it to a semi-satisfying state. Conclusion: Once you manage to adjust to the pinpoint accuracy and reaction time of your enemies, and realize that the angelic powers are mostly not worth bothering with, Requiem can be quite fun, fast-paced and visceral action in roomy, good-looking environments, all wrapped in a theme most developers would prefer to avoid. However, considering Requiem has been re-released on various platforms (Steam, GOG), its performance on modern systems is inexcusable. Unfortunately the game's obscurity makes it unlikely that'll we'll ever get a decent port.